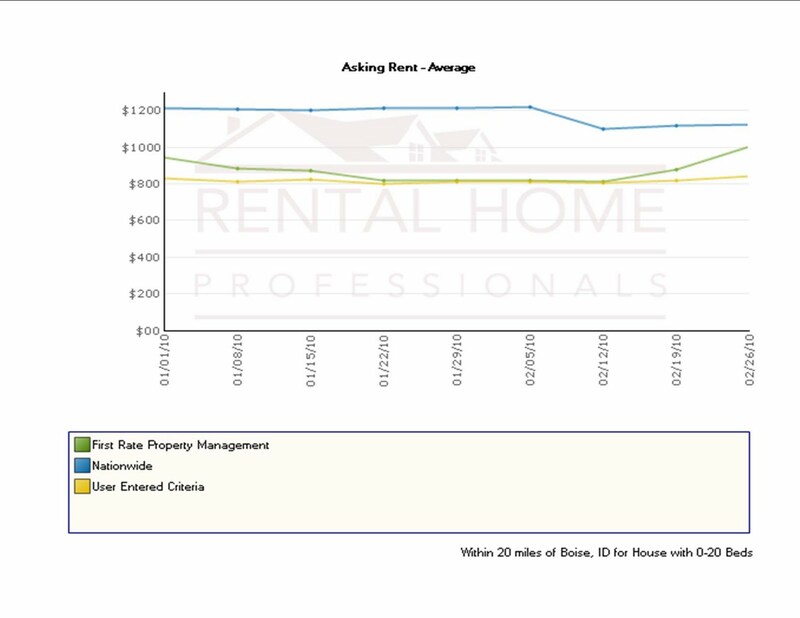 Below are graphs created by Rental Home Pros, who has the largest amount of rental data in the United States. These graphs show First Rate Property Management’s data as compared to the nation and our local competitors. The GREEN line represents First Rate Property Management, the BLUE line represents Nationwide, and YELLOW is our local competitors. 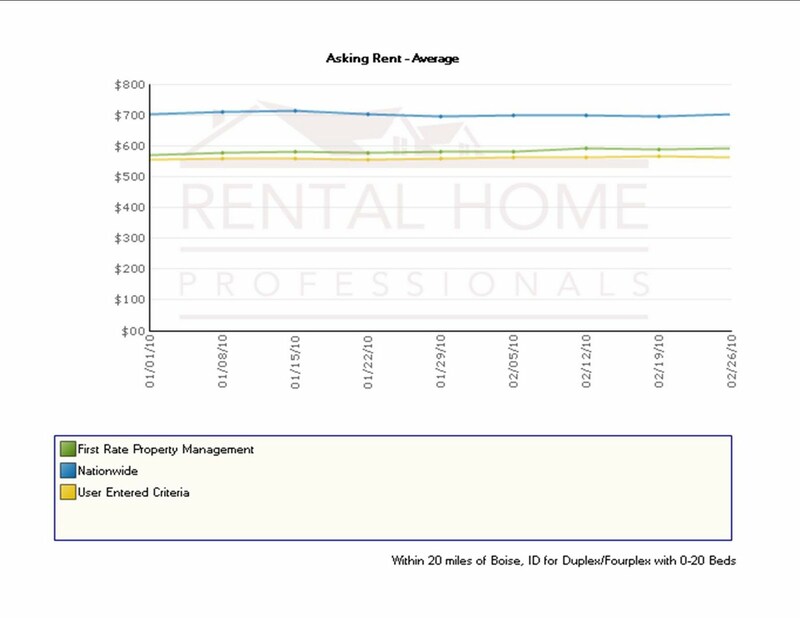 As the graphs below show, First Rate Property Managements rents on duplexes and 4 plexes are right at about $600 per month. This makes sense since most of our duplexes and four plexes are two bedrooms. 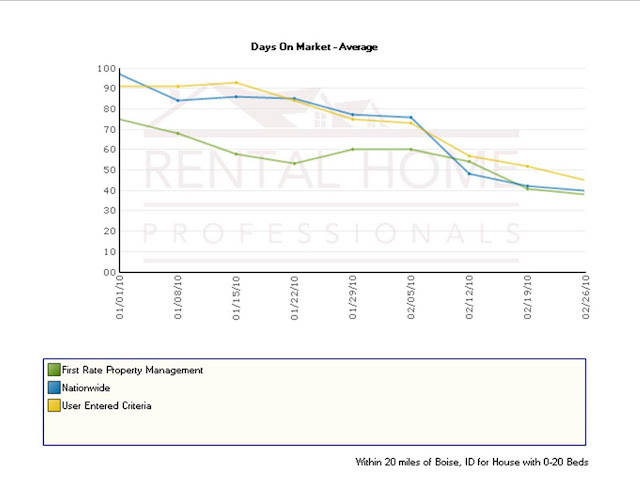 We are slightly above the competition and about $100 lower than the national average. And the graph immediately below this graph shows our average rents for single family home rentals. Again, we’re just a tad bit higher than our local competitors. And finally, our vacancy rate as compared to the nation and local property managers. 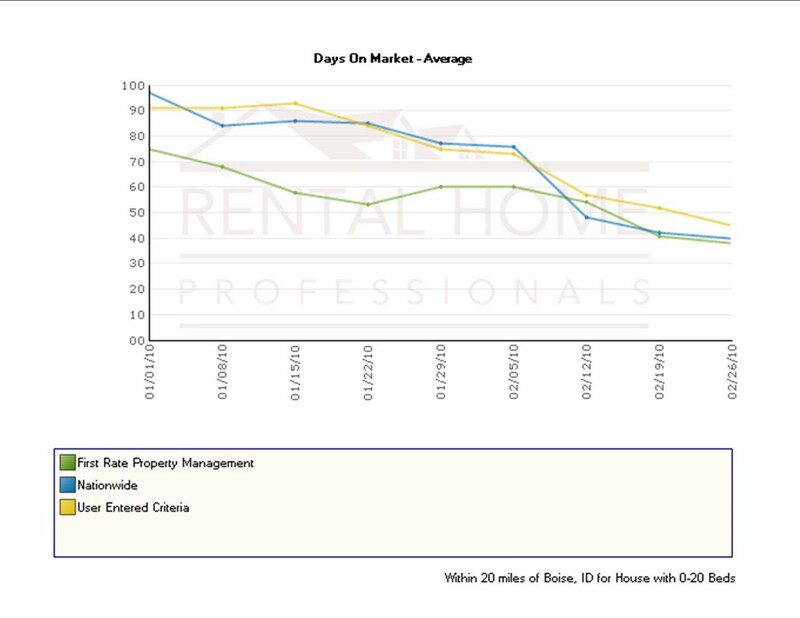 As you can see, our vacancy rate has been on a downward trend and the our competitors have remained fairly constant at just below 10%. Again, I believe the data to be slightly skewed as our vacancy rate has been lower than this. Assuming all data is skewed evenly, we’re doing very well. 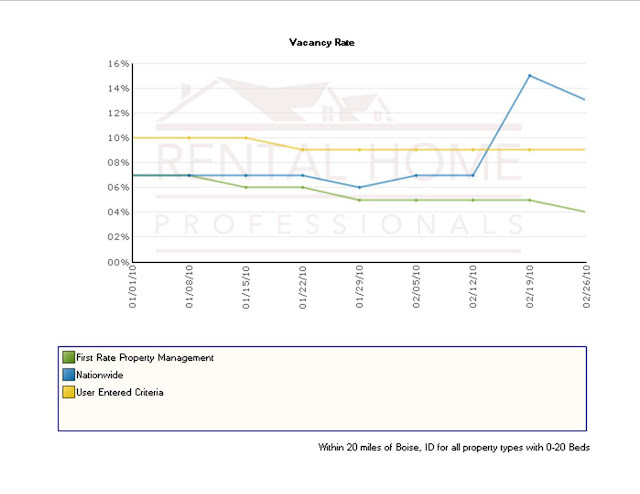 In the 3rd week of March, our vacancy rate increased to 3.2%. 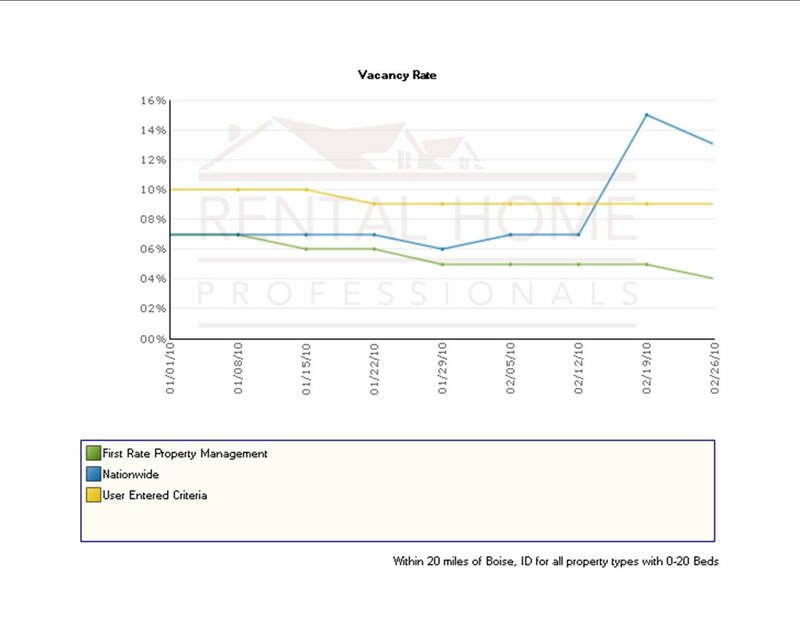 However, 1% of those vacant properties have leases signed and tenants moving in, but since they are still vacant, we count them. Obama’s Health Care and Will it Affect Rental Property Investments? So how are we going to pay for it? Well, I am not sure anyone knows, but I think I have uncovered some strong possiblities. According to a March 17th Wallstreet Journal article, we could be looking at a 2.9% medicare tax increase on RENTS and CAPITAL GAINS. Capital gains tax was scheduled to return to 20% at the end of this year anyways, so that may end up being 22.9%. A 1031 Tax Deffered Exchange will still protect or defer this tax for us investors who decide to sell and exchange into a better performing property. According to ths article, the 2.9% tax on rents will be only for those who make over $200,000 individually or $250,000 for married couples. I’ll keep you posted as I learn more.